It’s that time of the month again and by that, I of course mean we are due for the release of the next issue of Long Lost. With the buildup of issue four, I anticipated Long Lost issue five to be the most exciting issue yet and I certainly was not disappointed. Upon finishing issue five, did I immediately contact Long Lost writer, Matthew Erman, personally to ensure issue six was close behind? You better believe it, and fret not, dear friends, the answer is YES! Erman’s work on issue five certainly packs one hell of a punch. 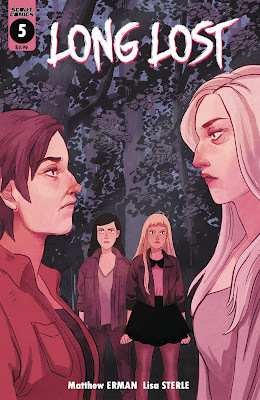 I’ve been singing the praises of the slow burn that makes this series so memorable since its initial release in September of 2017 and with issue five we are finally seeing a lot more action and pieces of the puzzle coming together. The proverbial curtains are finally opening and we are getting that first look into what is happening in the mysterious town of Hazel Patch. This particular issue focuses less on our beloved sisters, Piper and Francis and more on the supernatural plague that has been tormenting the people of the town. 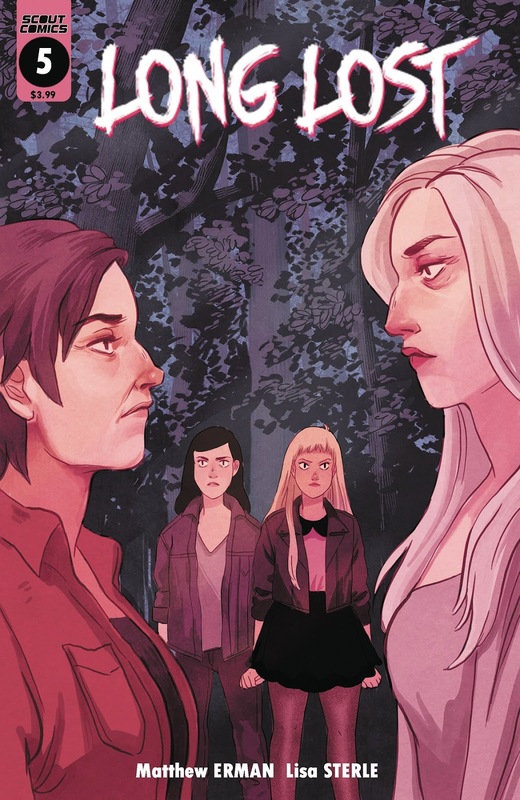 The issue opens with a brief glimpse into the past of the two girls, offering a peek of exactly what went wrong with their mother, but still leaving us with a lot of unanswered questions. We learn that they have a long lost aunt, the youngest of their mother’s sisters, a mysterious woman named Joanna. Piper and Francis are skeptical of this woman, who is offering little knowledge in regards to what has happened to their missing mother as well as what exactly her involvement is with the town’s crisis. As we get toward the end of this issue, things start getting extremely interesting. Without offering spoilers, let’s just say everything is not exactly what it seems when it comes to Joanna and her apparent desire to heal the small town, ridden with sickness, decay and death. The mayhem we are left with at the close of the issue will certainly have followers of this series desperate for more, as was I.
I feel like a broken record at this point, but Lisa Sterle’s artwork on this series truly gets better and better with each issue. She has captured the horror of this issue with such an ease and the art communicates the unsettling turn that the series is starting to take. I love horror graphic novels, as I have mentioned in the past, and one of my favorite things about them is seeing each artist’s particular take on panels that involve violence or subjects of a grotesque nature. There is a level of femininity and beauty in the way Sterle’s work conveys even the most horrific scenes and that is something I greatly admire about her talent. She stays true to her form and you are left with a beautiful piece of art regardless of the subject matter, which is another reason I find this series so special. Though I have communicated that I have such a strong appreciation for how slowly the horrific plot of Long Lost has unfolded, it was incredibly satisfying to read an issue where the story picked up steam and started to showcase just what the story is all about. Issue five was everything I have been waiting for and more. Although we still don’t have all of the answers that we need, we were given enough of a look into this crazy world to keep us completely hooked and ready for more! Issues 1-5 will be combined and released as a trade paperback, set to be released to the public on June 27th. In the meantime, we have issue six to greatly look forward to, which a little birdie, and by little birdie I mean the writer whom I pestered for news regarding the series, informed me was going to be released in late April!